Three not of a kind. 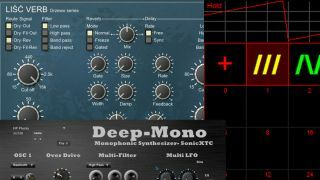 All three of this week's releases appears to take a 'keep it simple' approach to design, but that doesn't mean that the sounds they can help you to produce have to be run-of-the-mill. Designed in the spirit of the classic '70s monosynths, this single-oscillator instrument promises to be easy to program - all of its parameters are displayed on the front panel. There are 70 presets, but the real fun may come in creating your own. A reverb/delay effect that's designed with simplicity in mind. Use it for everything from creating pad ambiences to textured beats. You can also throw a state-variable filter into the mix for additional creative opportunities. Sonic BND does realtime audio pitchbending with an LFO. There's a plus/minus 12 semitone range and six types of waveform, while the LFO rate can be synced to your current BPM.